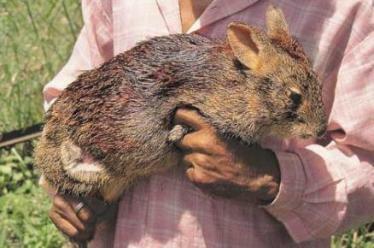 Except for a few indirect pieces of evidence, no detailed information is available about the Hispid hare (Caprolagus hispidus) in Manas National Park. Up to date information on the distribution, viable population, and survival threats is crucial to prepare strategies and develop effective conservation policies and measures. The proposed study will carry out intensive surveys in the grasslands and adjoining fringe areas to determine their ecological status, distribution, level of threat and exploitation. The project will also attempt to educate local people and train local grassroots NGOs and ground level forest staff about Hispid hare conservation. We will use indirect methods (pellet surveys) by following belt transects and prepare habitat/distribution maps using ARCVIEW (GIS) software.